S2L Waveform displays the audio input graphically. It is a timeline representation. ▪ Color - Defines the color using a Color Gradient control. The default color is Red, Yellow, Green, Cyan, Blue, Magenta. ▪ BPM - Defines the speed. The default speed is 60. You can either use BPM or Time Slot. Valid values range from 0 to 9999. ▪ Time Slot - Defines the time interval [in s]. The default value is 1. You can either use BPM or Time Slot. Valid values range from 0.01 to 9999. Channel - Allows you to choose the displayed audio channels [Stereo, Mono, Left, Right]. The default value is Mono. A context menu allows you to quickly make changes to the colors. 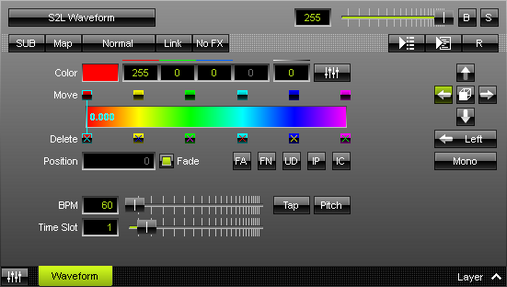 ▪ Right Mouse Click - Click with your right mouse button on the color gradient to call up the context menu. ▪ Open... - Loads a previously saved Color Table file from an external file [of the file type *.mctx]. ▪ Save... - Saves the current colors as a Color Table file [of the file type *.mctx]. ▪ Copy - Copies the current colors into the clipboard as a duplicate. ▪ Paste - Applies all colors from the clipboard to the currently focused color control [Colors, M2L Colors]. ▪ Defaults - Restores all default gradient colors.